Travelling Togo is (relatively) safe. 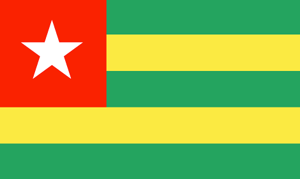 Togo is a country in Africa (Western Africa) with around 6 million citizens and a land mass of 56,785 km². We detected travel advisories from 4 sources for this country. Togo shares land borders with 3 neighbouring states. For this country, the Danger Index is 2.8 (average value for all countries). All countries habe been reported as somehow dangerous: Burkina Faso (3.5), Benin with (2.5) and Ghana with (2.3 of 5). See danger map of the region. Exercise normal precautions in Togo. Some areas have increased risk. Read the entire Travel Advisory. Level 3 Areas - Reconsider Travel To: Northern border region adjacent to Burkina Faso due to terrorism. Level 2 Areas - Exercise Increased Caution In: The cities of Sokodé, Bafilo, and Mango due to civil unrest. Read the Safety and Security section on the country information page.